Swami Vivekananda Chair, Central University of Jammu celebrated Good Governance Day on 25th December, 2017 on the theme, “Ushering Good Governance Through Seva Parmo Dharma”. Good Governance Day is observed on 25th December every year highlighting the Government’s continuous endeavours to provide efficient and transparent administration and accountability in the functioning of the government machinery which is a vital tool for the welfare of the nation. Welcome address was delivered by Dr. S.K. Sharma, Professor, Swami Vivekananda Chair. He emphasized that administrators be made conscious of the fact that they are basically citizens of free India first and should have imaginative sympathy besides technical knowhow of the subject matter. The administrator is a human being and have to perform the role of a functionary and has not to be merely efficient, quick and impartial in decision making but has to be humane also. The civil servants should remember that they are judged largely by contribution they make to the security and happiness of the people and that is only possible provided they possess fully awakened social conscience. Guest of Honour, Sh. K.B Jandial, IAS, Former Member Public Service Commission, J&K, appreciated that the topic has been rightly chosen as “Seva Parmo Dharma” which is the ultimate ethos of Indian society and is connected with governance. He dwelt upon the question why do we need Government and Governance? And also discussed about the Ethics of Administration as explained by Swami Vivekananda ji. The motto of Government should be citizen first and good governance should encompass everything that is for the betterment of the citizens. While highlighting the principles of good governance as propounded by Kautilya in Arthashastra, Mr. Jandial also discussed the initiatives taken by Modi Government for the welfare of the citizens. He observed now-a-days the focus has shifted from Government to citizen centric governance. But the vital question is, has the situation for common man changed? There should be active participation of citizens in governance in order to make it beneficial to the governed. But the sad part of the concept of good governance is that today judiciary is practically running the government. We have been on the road to good governance, but the journey is too long and bumpy. 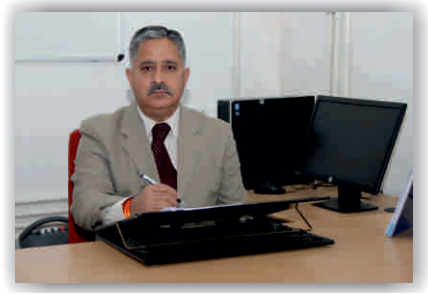 Dr. Ashok Bhan, IPS, Former Director General of Police (J&K) appreciated the initiative of the Central University of Jammu and the topic chosen for celebrating the good governance day. He said that in the present scenario, the meaning of ‘Service’ has changed from ‘Selfless Service’ to ‘Service of Self’. His address comprised of three components i.e. the concept of governance and good governance; ingredients of Seva Parmo Dharma and how the concept of Seva Parmo Dharma can usher good governance. He stated selfishness is the chief sin according to Swami Vivekananda. Seva has to be selfless. Governance must be citizen-centric, however, today the common man is distressed with the dismal performance of the political executive. Government is trustee of public money and must use it through various welfare schemes judiciously so that it does not fall in the hands of corrupt people who are entrusted with the task of execution of works allocated by the government. He discussed Staircase Model highlighting corruption at various levels. He strongly urged to focus on Preventive Vigilance rather than on punitive one which is key to good governance. He advocated moral education and ethics so that the concept of selfless service is inculcated not only among the administrators but the civil society as well. He emphasized that ways and means have to be found to contain corruption and bring transparency in the actions of the government. Professor Ashok Aima, Hon’ble Vice Chancellor, Central University of Jammu spoke that the capacity building measures be adopted and individual’s potential be recognized so that the dependency syndrome is removed. He stressed that people’s perception about governance need to be changed and they should be active participants in all welfare initiatives taken by the government. He apprised the audience about the good governance initiatives taken by Central University of Jammu such as online file tracking, agenda and the minutes of all the Governing bodies of the University displayed on the website. He informed that the university is also conducting skill based programs such as B. Voc in collaboration of VLCC to train the girls, and under Pt. Madan Mohan Malaviya faculty development program, the teachers are being trained. Further he apprised the audience that the university is also in the process of establishing Centre of Excellence for Good Governance and Ethics, and has taken up various capacity building initiatives with the active collaboration of Administrative Staff College of India (ASCI) Hyderabad. The audience comprised of faculty members, officers, staff, students of the university and prominent members of the civil society as well. The vote of thanks was delivered by Dr. Rouchi Choudhary and the stage proceedings were conducted by Dr. D. Paul Sugandhar.